Part 5 in a series of posts on modern macroeconomics. 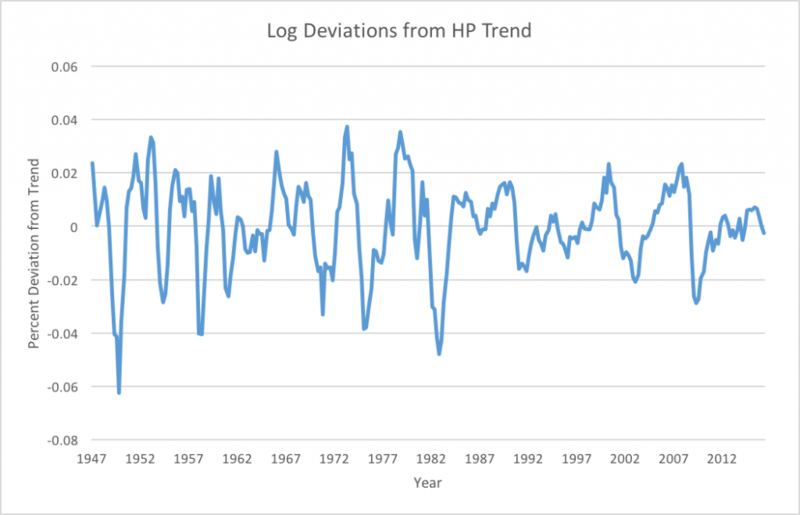 In this post, I will describe some of the issues with the Hodrick-Prescott (HP) filter, a tool used by many macro models to isolate fluctuations at business cycle frequencies. The last picture is what the RBC model (and most other DSGE models) try to explain. By eliminating the trend, the HP filter focuses exclusively on short term fluctuations. This shift in focus may be an interesting exercise, but it eliminates much of what make business cycles important and interesting. 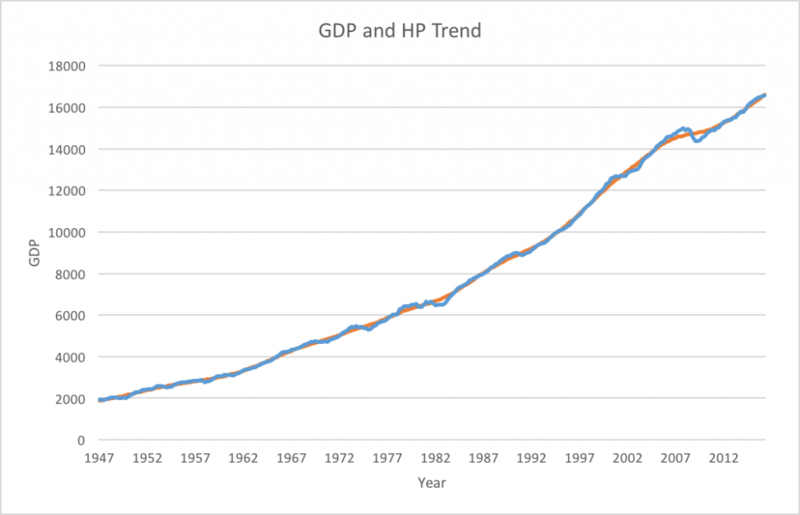 Look at the HP trend in recent years. Although we do see a sharp drop marking the 08-09 recession, the trend quickly adjusts so that we don’t see the slow recovery at all in the HP filtered data. The Great Recession is actually one of the smaller movements by this measure. But what causes the change in the trend? The model has no answer to this question. 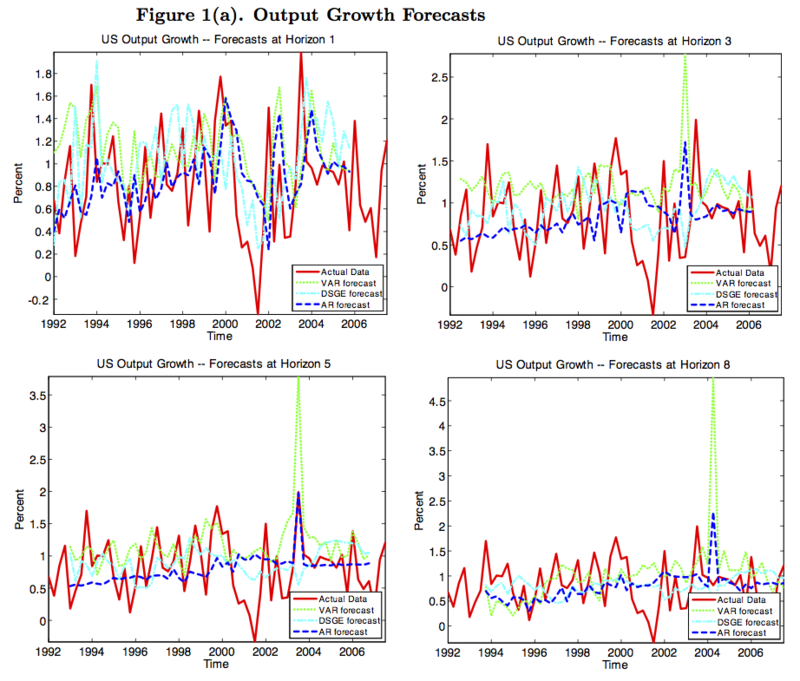 The RBC model and other DSGE models that explain HP filtered data cannot hope to explain long periods of slow growth because they begin by filtering them away. Source: Harald Uhlig (2003): How well do we understand business cycles and growth? 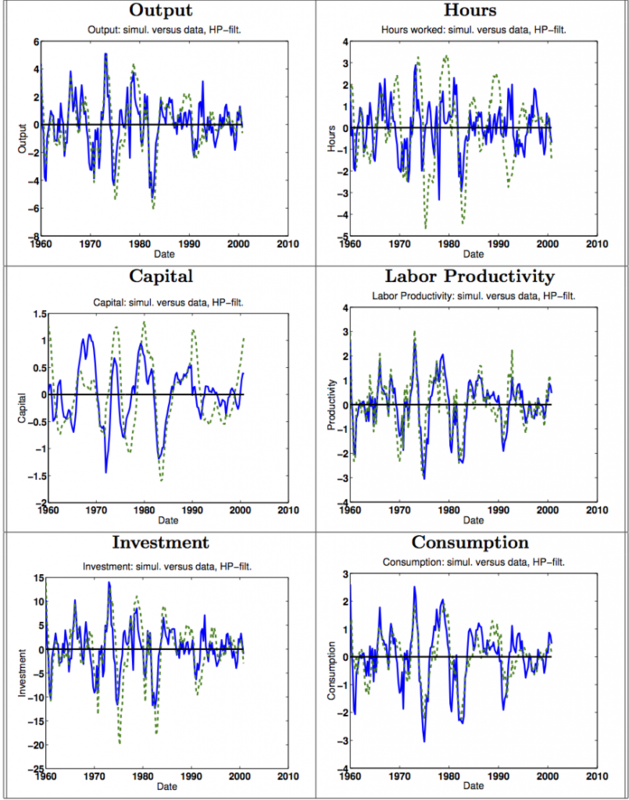 Examining the data with a real business cycle model. Yeah. So much for that great fit. Roger Farmer describes the deceit of the RBC model brilliantly in a blog post called Real Business Cycle and the High School Olympics. He argues that when early RBC modelers noticed a conflict between their model and the data, they didn’t change the model. They changed the data. They couldn’t clear the olympic bar of explaining business cycles, so they lowered the bar, instead explaining only the “wiggles.” But, as Farmer contends, the important question is in explaining those trends that the HP filter assumes away. Maybe the most convincing reason that something is wrong with this method of measuring business cycles is that measurements of the cost of business cycles using this metric are tiny. Based on a calculation by Lucas, Ayse Imrohoroglu explains that under the assumptions of the model, an individual would need to be given $28.96 per year to be sufficiently compensated for the risk of business cycles. 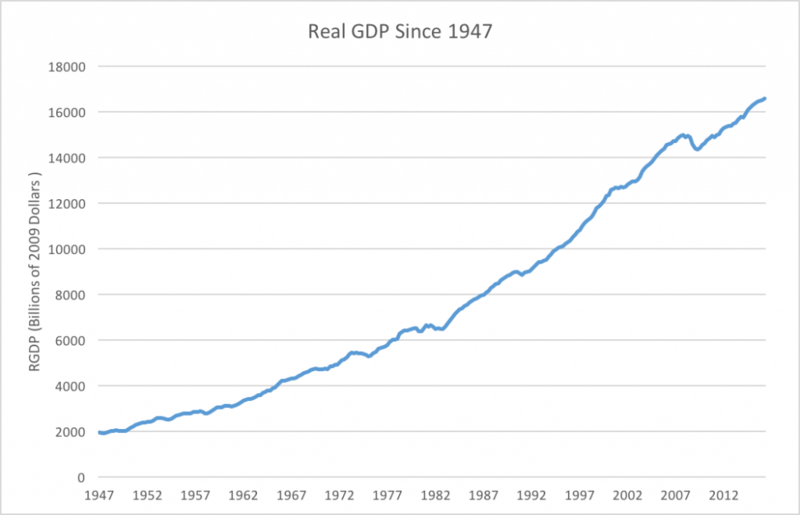 In other words, completely eliminating recessions is worth about as much as a couple decent meals. Obviously to anyone who has lived in a real economy this number is completely ridiculous, but when business cycles are relegated to the small deviations from a moving trend, there isn’t much to be gained from eliminating the wiggles. There are more technical reasons to be wary of the HP filter that I don’t want to get into here. A recent paper called “Why You Should Never Use the Hodrick-Prescott Filter” by James Hamilton, a prominent econometrician, goes into many of the problems with the HP filter in detail. He opens by saying “The HP filter produces series with spurious dynamic relations that have no basis in the underlying data-generating process.” If you don’t trust me, at least trust him. TFP doesn’t measure productivity. HP filtered data doesn’t capture business cycles. So the RBC model is 0/2. It doesn’t get much better from here. What’s Wrong With Modern Macro? Part 4 How Did a "Measure of our Ignorance" Become the Cause of Business Cycles? Part 4 in a series of posts on modern macroeconomics. Parts 1, 2, and 3 documented the revolution that transformed Keynesian economics into DSGE economics. 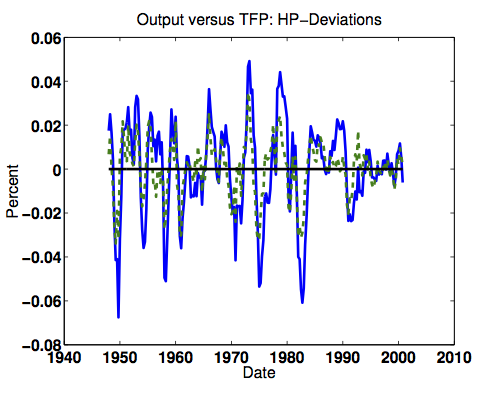 This post begins my critique of that revolution, beginning with a discussion of its reliance on total factor productivity (TFP) shocks. In my last post I mentioned that the real business cycle model implies technology shocks are the primary driver of business cycles. I didn’t, however, describe what these technology shocks actually are. 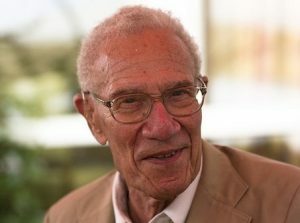 To do that, I need to bring in the work of another Nobel Prize winning economist: Robert Solow. Previous posts in this series have focused on business cycles, which encompass one half of macroeconomic theory. The other half looks at economic growth over a longer period. In a pair of papers written in 1956 and 1957, Solow revolutionized growth theory. His work attempted to quantitatively decompose the sources of growth. Challenging the beliefs of many economists at the time, he concluded that changes in capital and labor were relatively unimportant. The remainder, which has since been called the “Solow Residual” was attributed to “total factor productivity” (TFP) and interpreted as changes in technology. Concurrent research by Moses Abramovitz confirmed Solow’s findings, giving TFP 90% of the credit for economic growth in the US from 1870 to 1950. In the RBC model, the size of technology shocks is found by subtracting the contributions of labor and capital from total output. What remains is TFP. Y represents total output in the economy. All labor hours, regardless of the skill of the worker or the type of work done, are stuffed into L. Similarly, K covers all types of capital, treating diverse capital goods as a single homogeneous blob. Everything that doesn’t fit into either of these becomes part of A. This simple function, known as the Cobb-Douglas function, is used in various economic applications. Empirically, the Cobb-Douglas function matches some important features in the data, notably the constant shares of income accrued to both capital and labor. Unfortunately, it also appears to fit any data that has this feature, as Anwar Shaikh humorously points out by fitting it to fake economic data that is made to spell out the word HUMBUG. Shaikh concludes that the fit of the Cobb-Douglas function is a mathematical trick rather than a proper description of the fundamentals of production. Is it close enough to consider its residual an accurate measure of technical change? I have some doubts. There are also more fundamental problems with aggregate production functions that will need to wait for a later post. Does TFP Measure Technological Progress or Something Else? 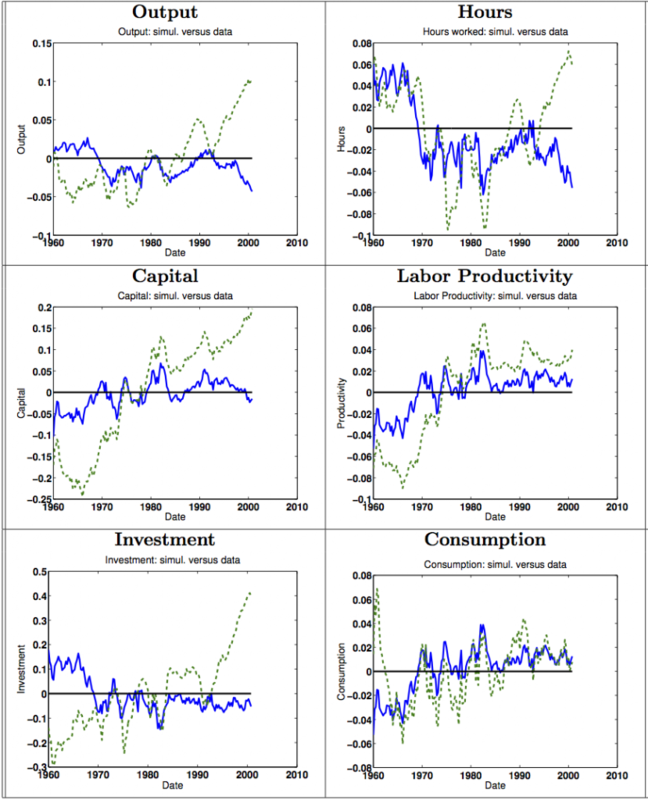 The technical change interpretation of the Solow residual runs into serious trouble if there are other variables correlated with it that are not directly related to productivity, but that also affect output. Robert Hall tests three variables that possibly fit this criteria (military spending, oil prices, and the political party of the president), and finds that all three affect the residual, casting doubt on the technology interpretation. Hall cites five possible reasons for the discrepancy between Solow’s interpretation and reality, but they are somewhat technical. If you are interested, take a look at the paper linked above. The main takeaway should be that the simple idealized production function is a bit (or a lot) too simple. It cuts out too many of the features of reality that are essential to the workings of a real economy. The criticisms of the production function above are concerning, but subject to debate. We cannot say for sure whether the Cobb-Douglas, constant returns to scale formulation is close enough to reality to be useful. But there is a more powerful reason to doubt the TFP series. In my last post, I put up these graphs that appear to show a close relationship between the RBC model and the data. Source: Harald Uhlig (2003): How well do we understand business cycles and growth? Examining the data with a real business cycle model. Second column shows the correlation from the full RBC model and the third with just the TFP series. What’s going on here? Basically, the table above shows that the fit of the RBC model only works so well because TFP is already so close to the data. For all its talk of microfoundations and the importance of including the optimizing behavior of agents in a model, the simple RBC framework does little more than attempt to explain changes in GDP using a noisy measure of GDP itself. The relationship of actual output and model output cannot indicate that the model has captured a deep economic relationship; for there is no such relationship to capture. Rather, it shows that we are seeing a complicated version of a regression fallacy: output is regressed on a noisy version of itself, so it is no wonder that a significant relationship is found. That the model can establish such a relationship on simulated data demonstrates that it can do so with any data that are similar in the relevant dimensions. That it has done so for actual data hardly seems subject to further doubt. Already the RBC framework appears to be on shaky ground, but I’m just getting started (my plan for this series seems to be constantly expanding – there’s even more wrong with macro than I originally thought). My next post will be a brief discussion of the filtering method used in many DSGE applications. I will follow that with an argument that the theoretical justification for using an aggregate production function (Cobb-Douglas or otherwise) is extremely weak. At some point I will also address rational expectations, the representative agent assumption, and why the newer DSGE models that attempt to fix some of the problems of the RBC model also fail. Author Chris SurroPosted on September 6, 2016 October 7, 2016 Categories EconomicsTags DSGE, Macroeconomics, Methodology, RBC, TFP, What's Wrong With Macro?Leave a comment on What’s Wrong With Modern Macro? Part 4 How Did a "Measure of our Ignorance" Become the Cause of Business Cycles? Part 3 in a series of posts on modern macroeconomics. Part 1 looked at Keynesian economics and part 2 described the reasons for its death. In this post I will explain dynamic stochastic general equilibrium (DSGE) models, which began with the real business cycle (RBC) model introduced by Kydland and Prescott and have since become the dominant framework of modern macroeconomics. “What I am going to describe for you is a revolution in macroeconomics, a transformation in methodology that has reshaped how we conduct our science.” That’s how Ed Prescott began his Nobel Prize lecture after being awarded the prize in 2004. While he could probably benefit from some of Hayek’s humility, it’s hard to deny the truth in the statement. Lucas and Friedman may have demonstrated the failures of Keynesian models, but it wasn’t until Kydland and Prescott that a viable alternative emerged. Their 1982 paper, “Time to Build and Aggregate Fluctuations,” took the ideas of microfoundations and rational expectations and applied them to a flexible model that allowed for quantitative assessment. In the years that followed, their work formed the foundation for almost all macroeconomic research. The basic setup of a real business cycle (RBC) model is surprisingly simple. There is one firm that produces one good for consumption by one consumer. Production depends on two inputs, labor and capital, as well as the level of technology. The consumer chooses how much to work, how much to consume, and how much to save based on its preferences, the current wage, and interest rates. Their savings are added to the capital stock, which, combined with their choice of labor, determines how much the firm is able to produce. There is no money, no government, no entrepreneurs. There is no unemployment (only optimal reductions in hours worked), no inflation (because there is no money), and no stock market (the one consumer owns the one firm). There are essentially none of the features that most economists before 1980 as well as non-economists today would consider critically important for the study of macroeconomics. So how are business cycles generated in an RBC model? Exclusively through shocks to the level of technology (if that seems strange it’s probably even worse than you expect – stay tuned for part 4). When consumers and firms see changes in the level of technology, their optimal choices change which then causes total output, the number of hours worked, and the level of consumption and investment to fluctuate as well. Somewhat shockingly, when the parameters are calibrated to match the data, this simple model does a good job capturing many of the features of measured business cycles. The following graphs (from Uhlig 2003) demonstrate a big reason for the influence of the RBC model. 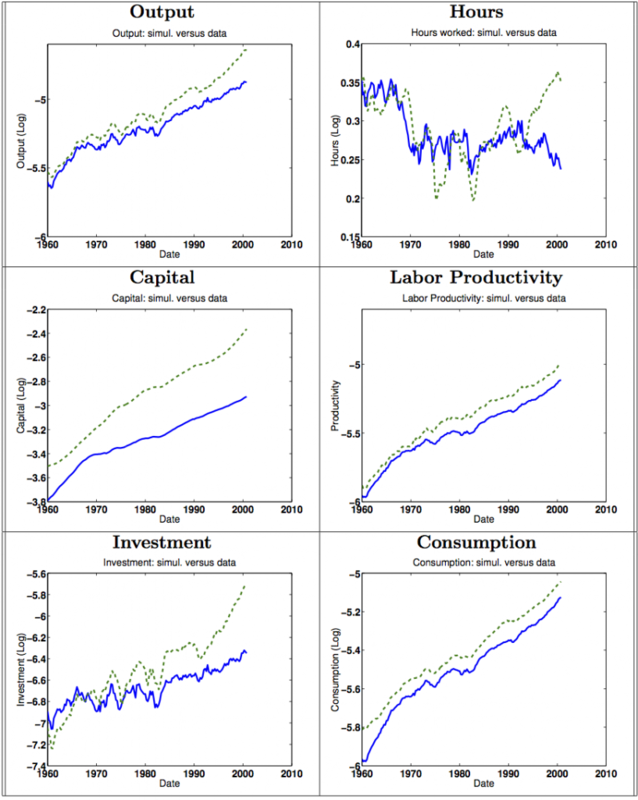 Looking at those graphs, you might wonder why there is anything left for macroeconomists to do. Business cycles have been solved! However, as I will argue in part 4, the perceived closeness of model and data is largely an illusion. There are, in my opinion, fundamental issues with the RBC framework that render it essentially meaningless in terms of furthering our understanding of real business cycles. Although many economists would point to the contribution of the RBC model in explaining business cycles on its own, most would agree that its greater significance came from the research agenda it inspired. Kydland and Prescott’s article was one of the first of what would come to be called Dynamic Stochastic General Equilibrium (DSGE) models. They are dynamic because they study how a system changes over time and stochastic because they introduce random shocks. General equilibrium refers to the fact that the agents in the model are constantly maximizing (consumers maximizing utility and firms maximizing profits) and markets always clear (prices are set such that supply and demand are equal in each market in all time periods). Due in part to the criticisms I will outline in part 4, DSGE models have evolved from the simple RBC framework to include many of the features that were lost in the transition from Keynes to Lucas and Prescott. Much of the research agenda in the last 30 years has aimed to resurrect Keynes’s main insights in microfounded models using modern mathematical language. As a result, they have come to be known as “New Keynesian” models. Thanks to the flexibility of the DSGE setup, adding additional frictions like sticky prices and wages, government spending, and monetary policy was relatively simple and has enabled DSGE models to become sufficiently close to reality to be used as guides for policymakers. I will argue in future posts that despite this progress, even the most advanced NK models fall short both empirically and theoretically.